You'll receive this quest from Rymrgand when you pray to him inside Teir Evron in Elm's Reach. Note: If you don't know how to pray to Rymrgand, then please refer to the quest entry for Council of Stars. Rymrgand will show you a vision of a "frost-hewn breach" in Noonfrost, and he'll ask you to seal it. To help you out, he'll give you a Glowing Ice Shard. You'll find Noonfrost in Oldsong. This means you'll have two ways to proceed to the breach. You can just walk to it, killing any pale elves who get in your way, or you can sneak to it. For the latter approach, you'll have to open some locked doors (#5, #6), but you'll only have to dodge a couple of guards. And since your goal is to keep things peaceful, you'll only need to sneak one character to the breach rather than your entire party. A high Stealth skill isn't required. When you get to the frost-hewn breach (#8), you'll meet Glasvahl there, and he'll talk to you -- even if you've been busily massacring all of the pale elves in the temple. Glasvahl will explain that he and his people are trying to enter the White Void so their souls can finally die. You'll be able to respond in one of three ways. You can attack Glasvahl. All of the pale elves in Noonfrost will turn hostile if you do this, so you'll have to fight everybody. Only Glasvahl's group might cause you problems. Just be sure to down his sorceress and priestess first. Once the battle is complete, don't forget to close the breach (by clicking on the pedestal in front of it). When you do, you'll earn a "major" reputation bonus with Twin Elms and an "extraordinary" bonus with the Fangs. With Resolve 17, you can convince Glasvahl to stop trying to enter the breach. All of the pale elves will then leave Noonfrost, and you'll gain an "extraordinary" reputation bonus with Twin Elms and "major" reputation bonus with the Fangs. Afterwards, you'll still need to close the breach (by clicking on the pedestal in front of it). You can give Glasvahl the Glowing Ice Shard. All of the pale elves will then go through the breach and disappear, and you'll lose "major" reputation with Twin Elms and "moderate" reputation with the Fangs. But realize that this is the opposite of what Rymrgand asked you to do. If you don't have Intellect 19, then you won't be able to convince him that you did the right thing, and you'll fail the quest. When you return to Rymrgand, if you did what he asked or if you're convincing, then he'll give you his favor, which you might need for the quest Council of Stars. 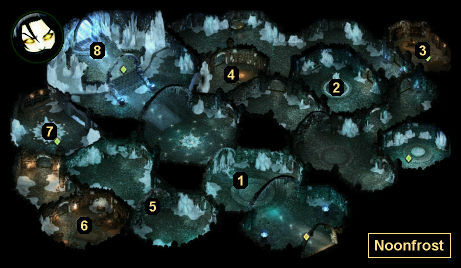 Alweh is involved in the quest Prison of Ice. You'll need the Silver Key (#3) or Mechanics 2 to enter the prison.